Service forms come in handy when a customer or client wants to file or present a request for particular service or maintenance of a particular entity, property or product. Also, service forms serve as feedback forms for services procured by clients, customers and all other kinds of respondents. 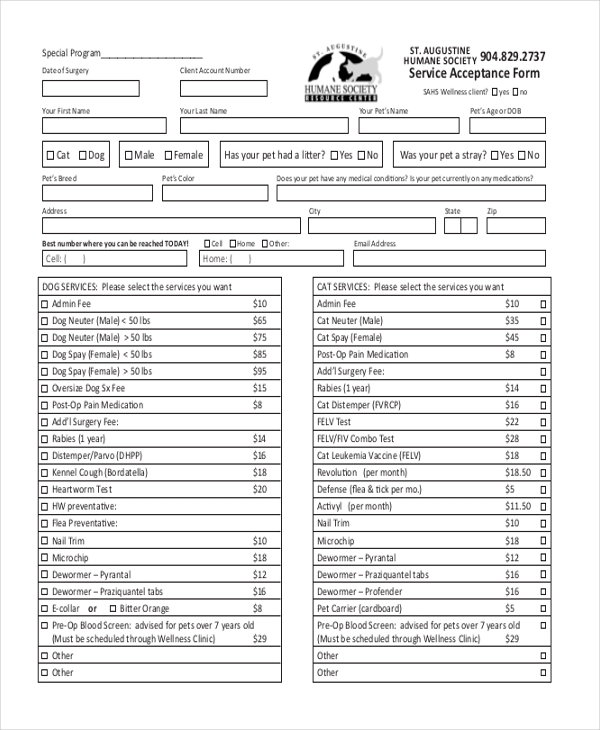 Interesting to note that service forms are very topical and purpose-oriented and so that’s why the layout and format of a service form may not standardize as it may be subject to change depending on nature and genre of the service form that is in use. A community service form is essentially used by schools and other community outlets for collecting information about the volunteers and the quality of their services during a certain event or function. Such a form is ideally distributed or handed to audiences who attended a community event and wish to express their thoughts after the conclusion of the same. A proof of service form is to be filled and filed if and when a conflict arises about whether or not a particular service was fulfilled. A proof of service document serves as a testimony, with accurate details specified in the form, directing to whether service has been successfully accomplished or not. 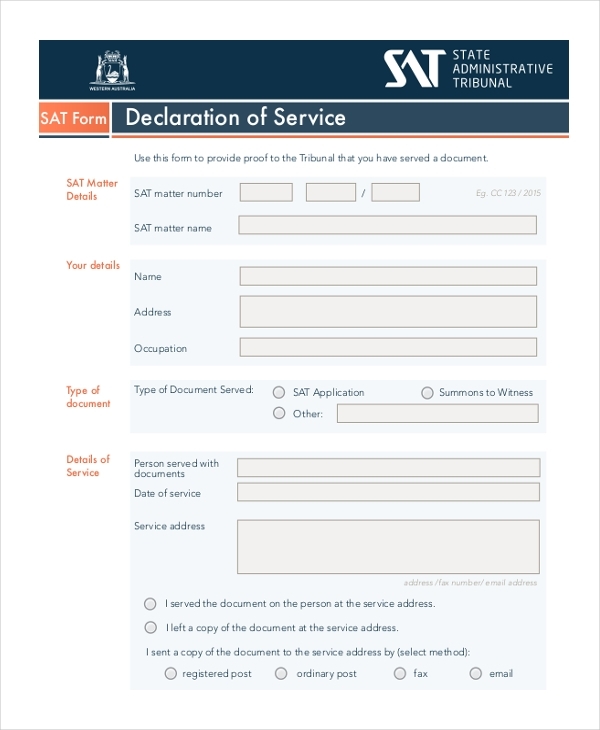 An acknowledgment of service form is used in the court of law. It is used by defendants who want to contest a particular claim made by a particular claimant(s). 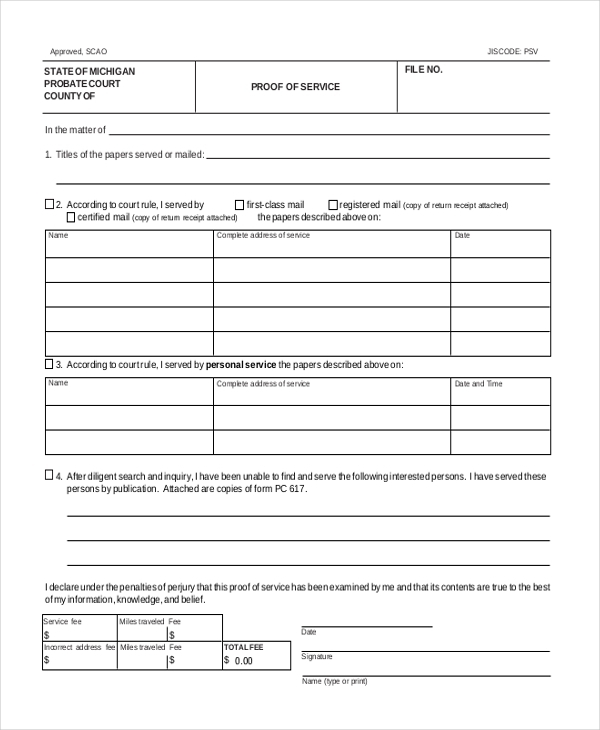 The form contains an elaborate of fields which need to be filled out by the defendant and also he or she must specify if they’d like to a paper or in-court settlement of the issue. A certificate of service is also very frequently used in matters related to housing and tenancy. In case an important document is sent to and delivered successfully to a building tenant or landlord, the authorities involved will show a certificate of service as proof of the document-delivery. The form has a range of fields including the address of the rental unit, a method of service delivery, the signature of document receiver, their full name and phone number. 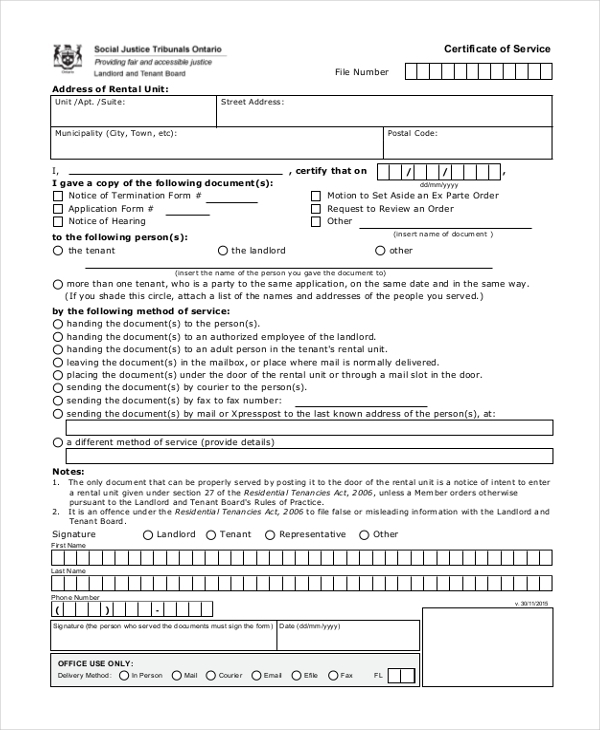 This is yet another format which is applied in the declaration of service forms, to establish that a document or parcel has been or had been delivered successfully or not to the concerned parties. Personal and delivery details need to be furnished accurately in the form. An employer checking service form is used to check and determine the immigration employment status of an existing or potential employee. This is a mandatory move for companies to decide is the candidate in question is eligible for employment or not. A feedback service form is given to customers are they have procured a service or too many from a particular organization. The feedback is used as a yardstick to improve or better the quality of products and services that the company currently provides. 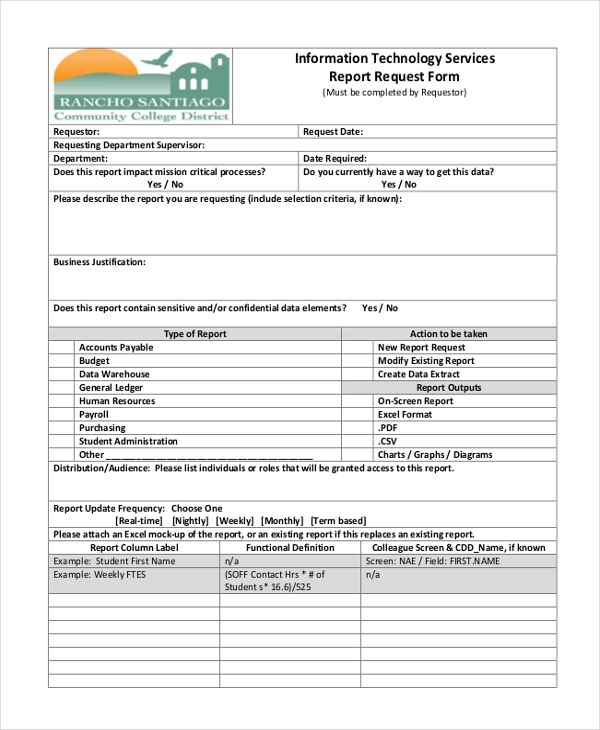 An IT service form is filled out by a requestor who wants to get hold of certain records or reports pertaining to an important matter. 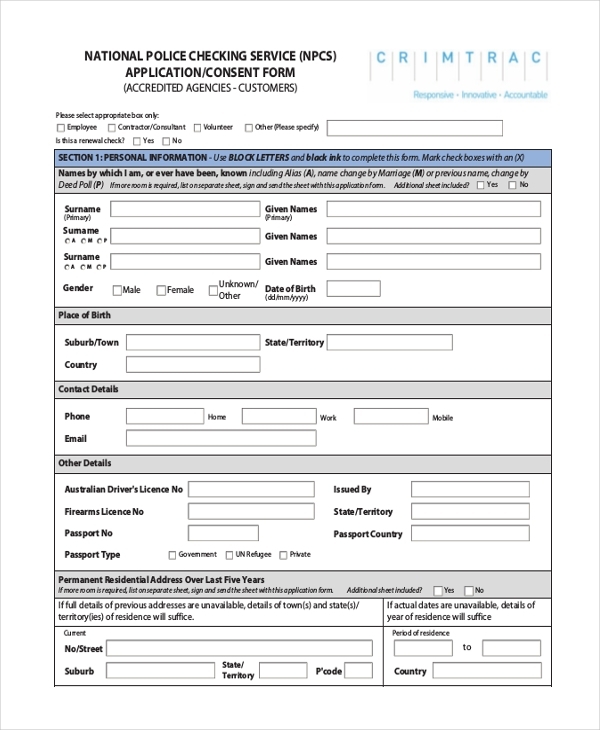 Such a service form is available to professionals working in companies and offices as well as students studying in colleges and schools. 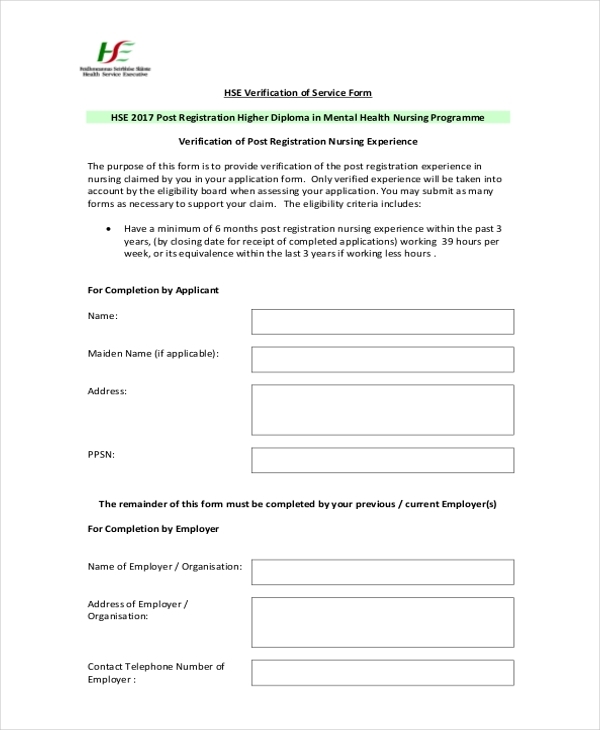 A long service form is used in various sectors for professionals. 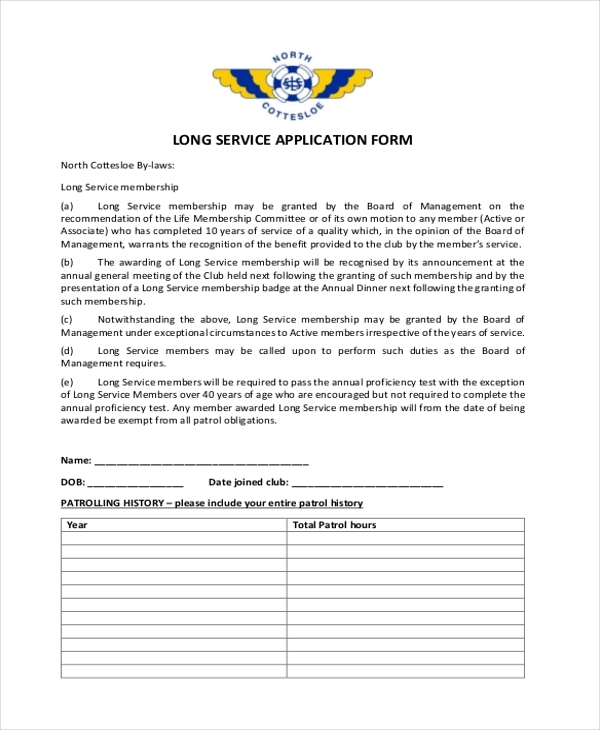 This particular long service form, example relates to the request for a membership in a certain club or association. 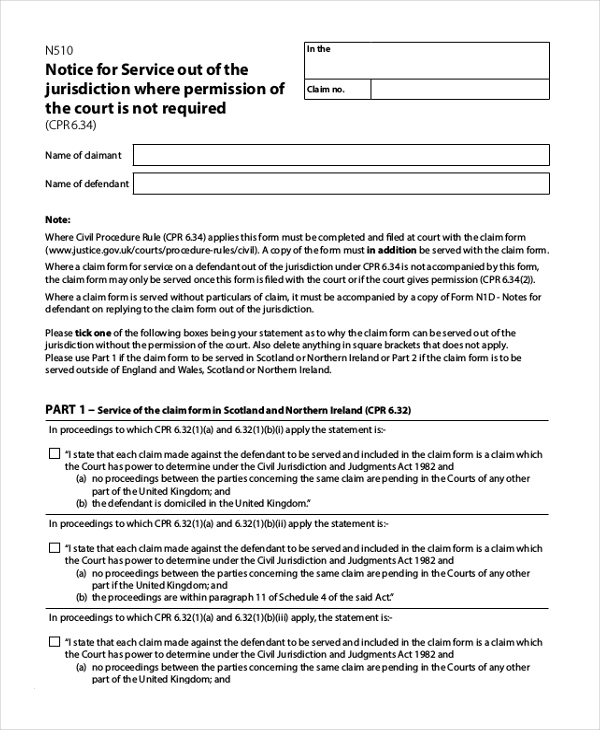 A notice of service form is usually used in legal matters of conflict. It could be any matter. 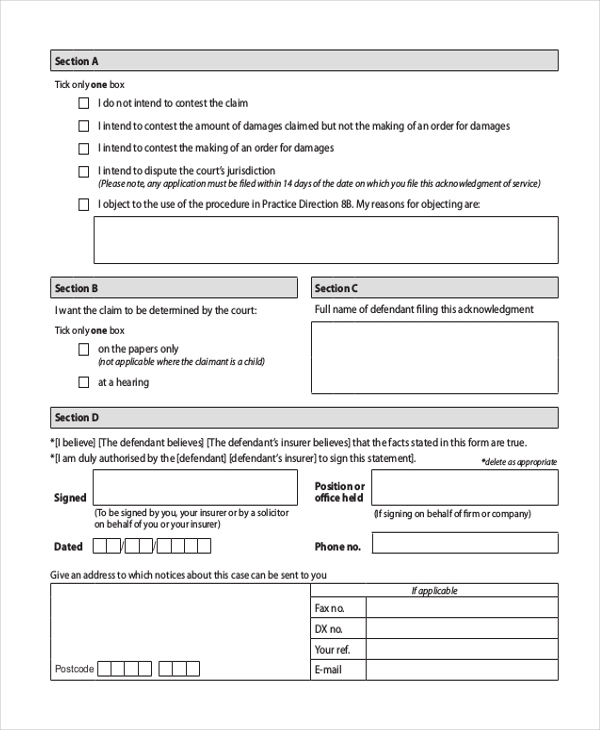 A form is a wide-ranging form which contains numerous statements as options which are supposed to be ticked after specifying the names of the defendant and claimant in the fields given at the beginning of the document. 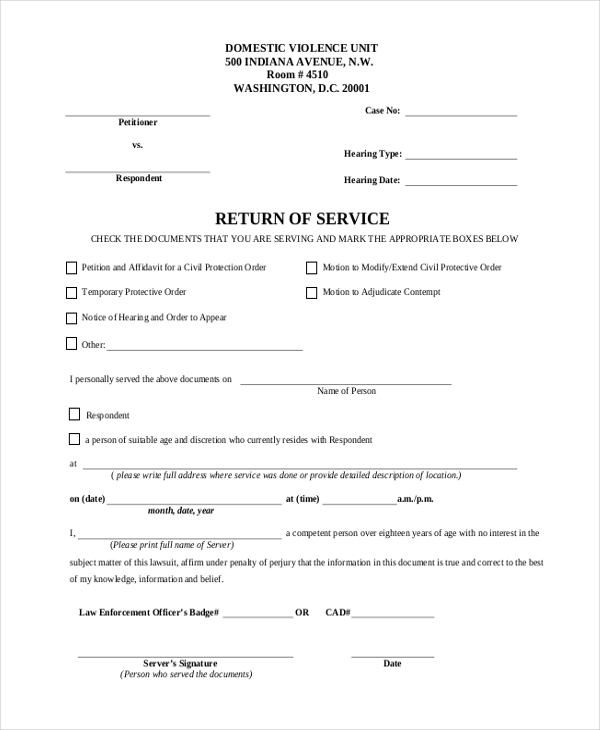 A return of service form is used is scenarios where a lawsuit is involved and the claimant and defendant have to establish accurate information regarding the same. 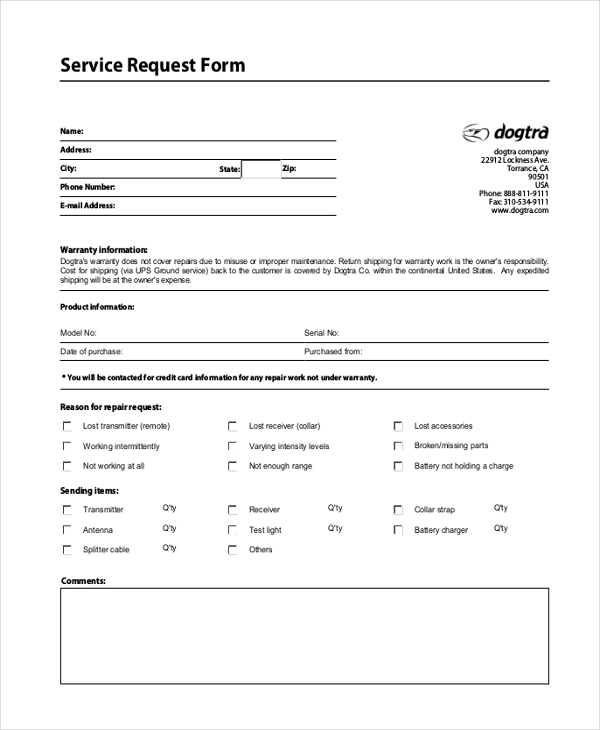 This is a vehicle service form which serves an important document when a customer comes in with a request for vehicle repairs. In the aftermath, a vehicle service form is supposed to be populated with all the information about the services and repairs done. 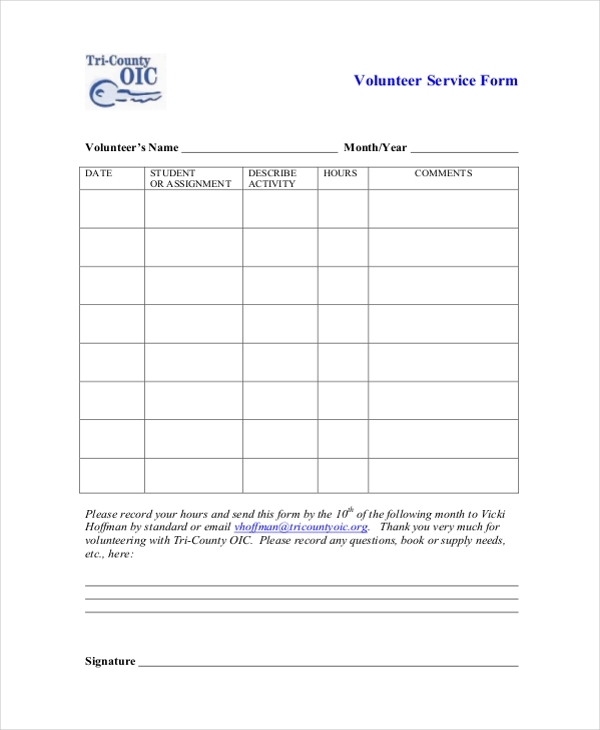 This is a volunteer service form which is used by volunteers working in charities, communities and NGOs. The volunteers are supposed to fill-up such a form to show their hours of committed service during a particular time period. An applicant claiming to be proficient in providing certain services, the employer company may want to cross-verify the services mentioned in the application by the applicant. In this scenario, the applicant is asked to populate a verification of service form for assessment. A form of this kind is useful at occasions where a customer or client has accepted to buy a particular service and its benefits. Afterward, the customer representative fills out a service agreement form on the customer or client’s behalf. 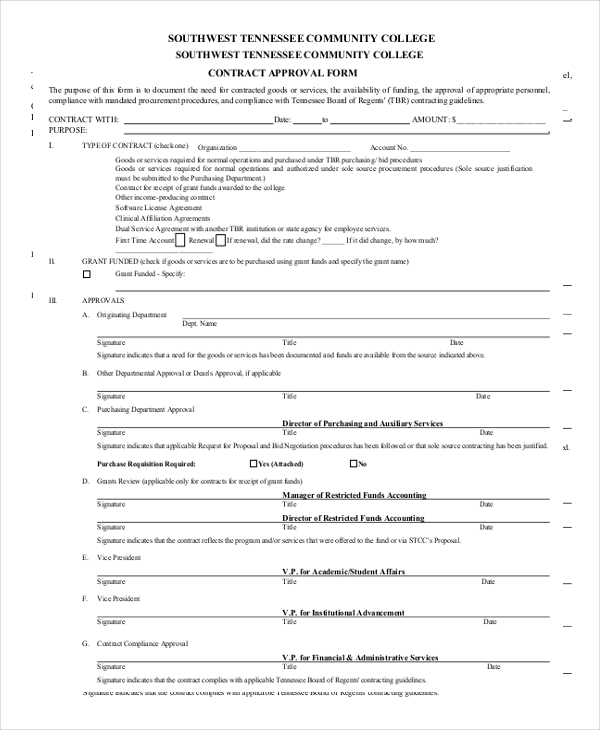 After a service procedure is successfully completed, the customer or client needs to fill-up a service acceptance form affirming the expenses of the services enlisted. 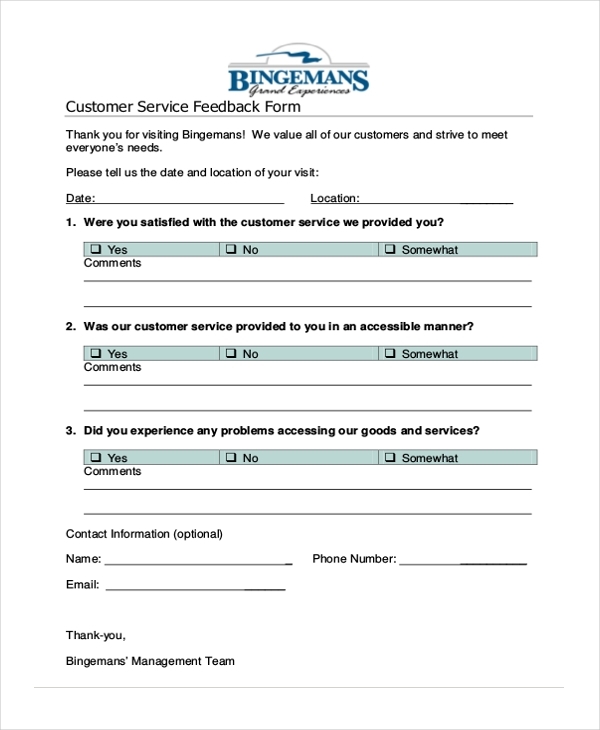 A service request form is filled out and submitted in companies and offices by customers or clients who have a complaint with the products which they purchased from the company’s office or stores. The reason for repair and items sent back for repair need to be spelled out correctly along with other preliminary information and details. 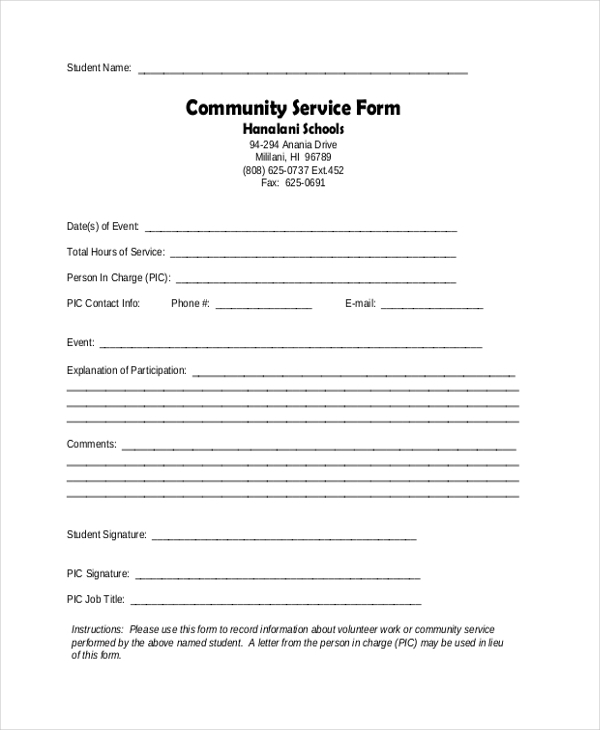 A service hours’ form is useful for teachers and other types of professionals who need to present their hour of community service in the form of a document. 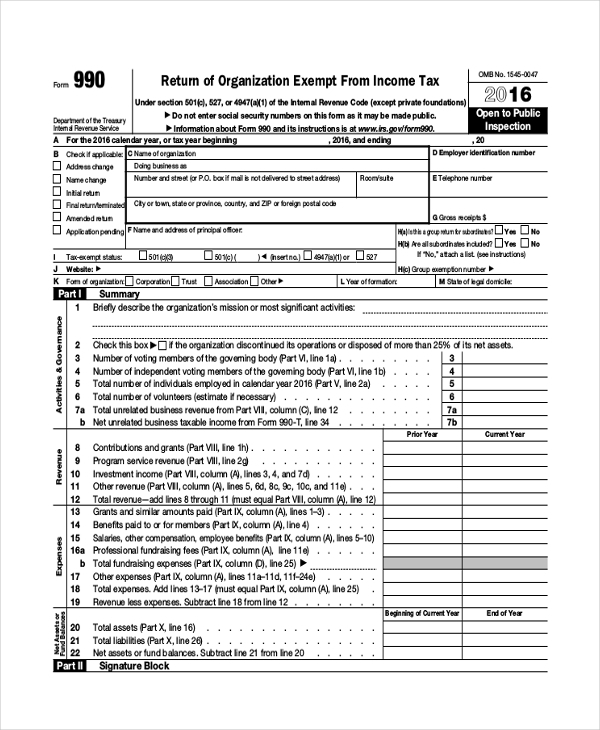 The document contains multiple blank fields that need to be filled with correct information, mainly focusing on details of the service hours given by the recipient of the form. 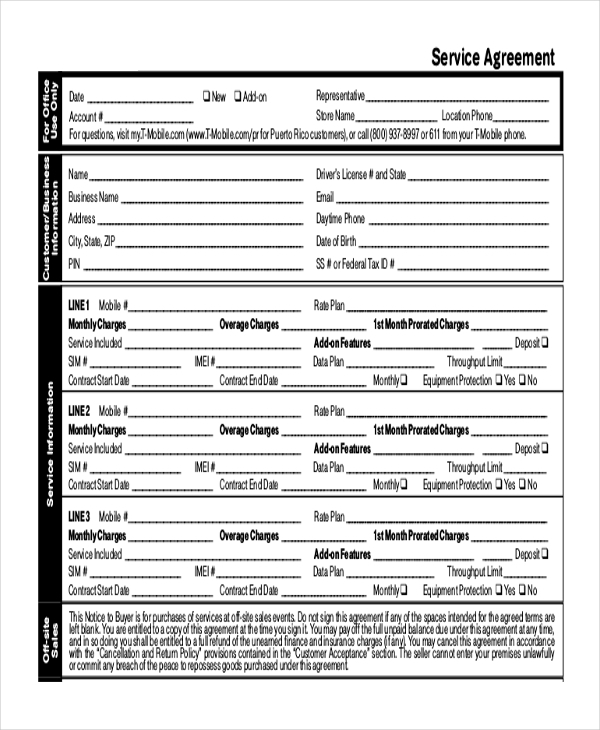 This is a form which used by the delivery boys of a company who are assigned to deliver packages and parcels to customers who placed an order for them. The form contains various fields and a time-sheet wherein the specifics and service times need to be mentioned. 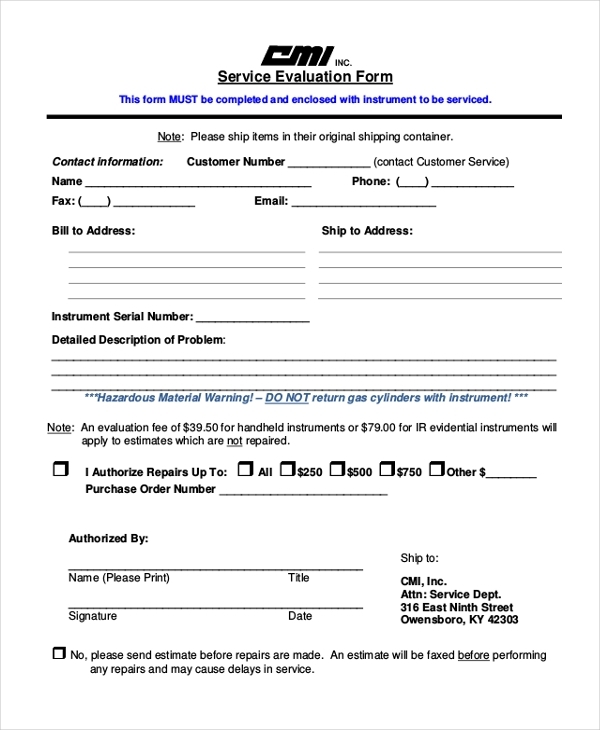 A service evaluation form is used in situations where a company has been contacted to send its personnel to do some fixes and repairs of goods or products which were purchased from the company. 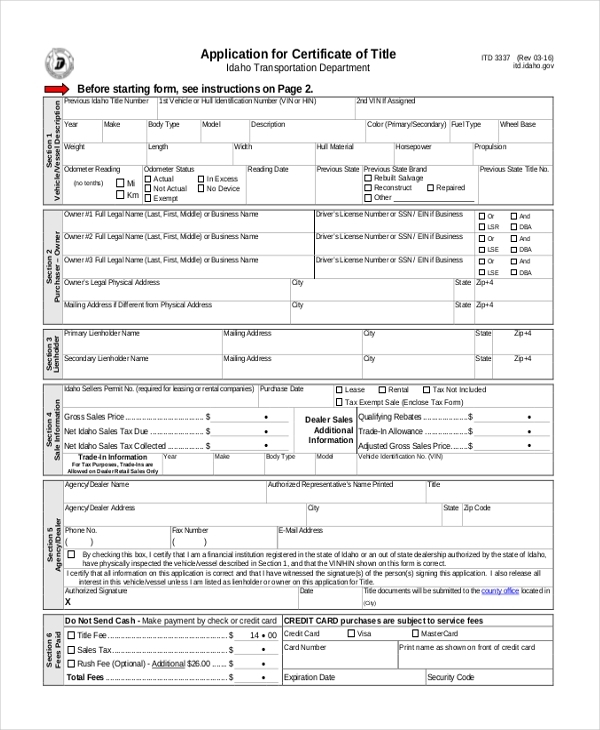 At the completion of the task, a service evaluation form needs to be filled out and submitted. 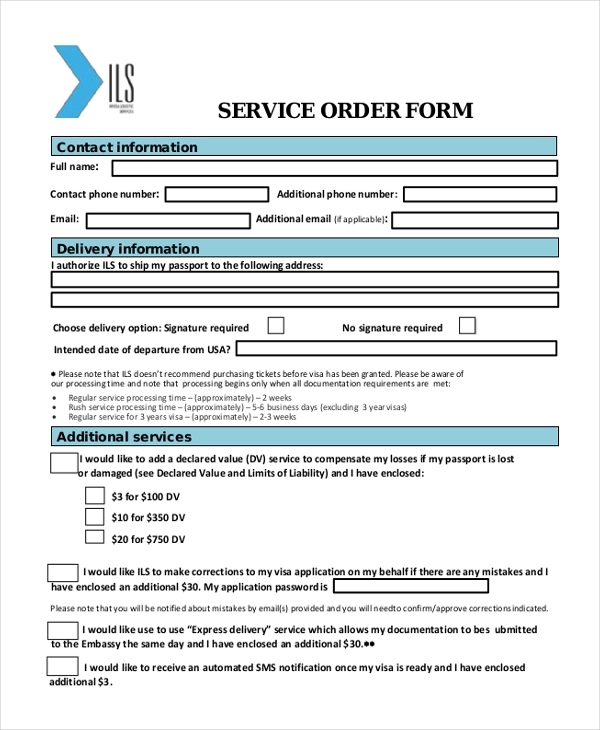 A service order form is filled out and issued by a company that is intent on the delivery of goods ordered by a customer or client. 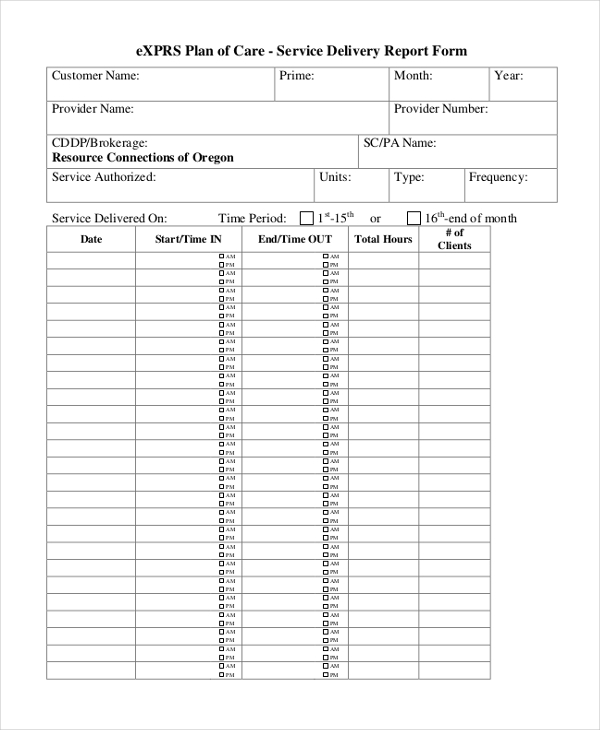 A service order form contains a set of fields wherein accurate relevant information along with shipping address and other specifics need to be specified, and also a signature at the end. A service contract approval form is bought into the scheme of things after the parties involved have agreed upon and approved of the terms and conditions which have been laid down in a service contract. The target audience of service forms varies and it depends largely on what kind of service form is being talked about and in what context. Across the Internet, users can easily come across an abundant collection of service forms of all different types in various formats. Depending on what users’ requirement is, service forms are easily available and can be downloaded and prepared in accordance to the target audience. As stated earlier, service forms are essentially used as proof of service documents and also as feedback of service documents in many organizations and companies worldwide. In the case of conflict regarding services, a duly filled service form can be presented as proof to establish whether or not the recipient received the required services. Service forms are great mediums of customer and client data collection purposes. Undoubtedly the best benefit of service forms is that they provide themselves with a database. The form is filled with abundant information about clients and customers which can be used as a positive yardstick for improvement and upliftment of service quality meted out by companies. Furthermore, service forms are recorded proof, so both clients and customers can always go back and cross-check in the case of any doubts they may have. The nature and genre of service forms are obviously wide-ranging and their need and popularity are unquestionable. They can be useful in various aspects of service and also serve a relationship between companies and customers!